Need a Speaker or Trainer for Tradeshow Marketing? I truly enjoy getting up in front of your group to talk, teach and discuss a lot of things related to tradeshow marketing: social media, staff training, event marketing, booth design, and other elements of tradeshow marketing. I’m available as a speaker in a breakout session at a conference, or as a panelist, or as a seminar leader/speaker/trainer for private engagements. And with the new book out, I have even MORE to talk about! 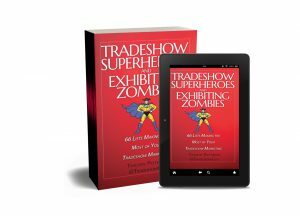 Think of a program featuring the 14 Steps to Tradeshow Mastery and how your group can benefit from it. September: Handshake.com webinar: Mastering Tradeshows in 10 Easy Steps June: Handshake.com webinar on the Essentials of Tradeshow Booth Design. Check out the replay and the slide deck. January: ISES Houston, speaking for a private function at 2020 Exhibits in Houston, Texas. May: Classic Exhibits ‘Shared Knowledge University’, speaking on using social media at events. Various webinars throughout the year.